The New York Giants very nearly came away with a stunning upset win over the Indianapolis Colts. Unfortunately, ‘almost’ doesn’t count in the NFL, and the Giants couldn’t close out a game they lead for 59 of 60 minutes. But, at least from the offensive side of things, we can say that this was probably the Giants’ best game of the season. So then, what made it so different from the previous 14 games? For the most part, Eli Manning played a good game against a Colts’ defense which was coming off a shut-out victory over the Dallas Cowboys. That good game wasn’t dependent, however, on Manning playing exceptionally well, but rather executing a well designed game-plan. The Giants started with the assertion that their offensive line wasn’t going to hold up to the Colts’ front seven. So rather than asking them to do so, Pat Shurmur relied on misdirection plays to slow down the Colts’ defense and give Manning time to make his reads. He also made great use of play-action and roll-outs to get Eli away from the pass rush and speed up his post-snap process with half-field reads. As a result, only three of Manning’s 33 passes were thrown into coverage, and the Colts only landed three quarterback hits all game. But despite relying on misdirection and quick passes, the Giants were not conservative in the passing game. 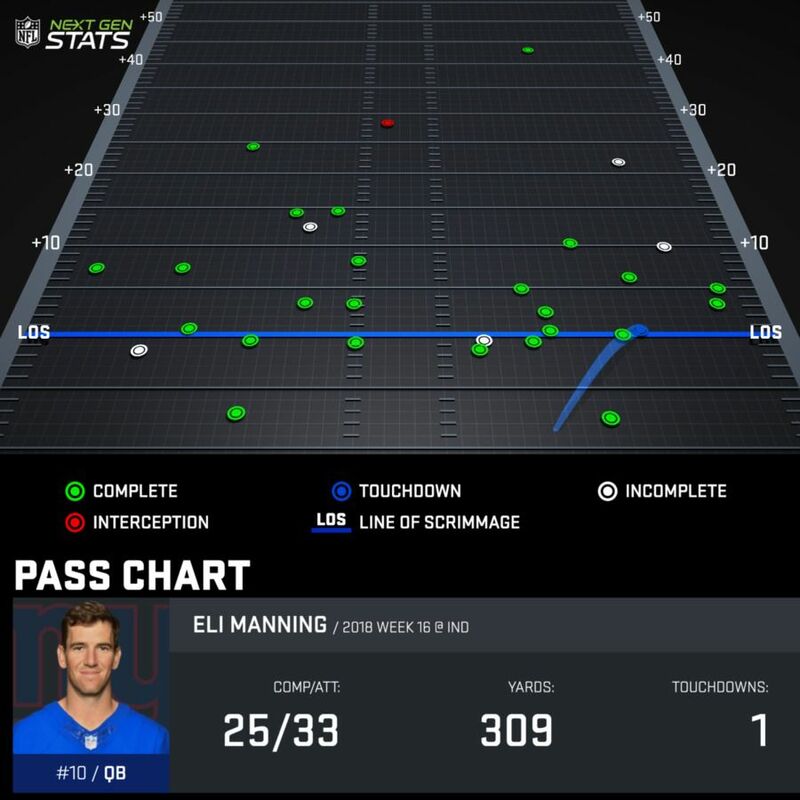 Eli’s average pass was, per Next Gen Stats, only .8 yards behind the first down marker, which is a dramatic improvement over the previous games. All told, Manning distributed the ball well and didn’t shy away from looking down the field. Heading in to the Giants’ game against the Tennessee Titans, the conversation was that the offense now flowed through Saquon Barkley. That cold, sloppy day against Tennessee proved that hypothesis to be incorrect. This game, the Giants acknowledged that without Odell Beckham they are missing a key cog in their offense. So rather than trying to force the ball through Barkley, they spread the ball around rather than rely on the running game. Over the last three weeks, Barkley has averaged roughly 2.5 yards per carry on 47 carries (excepting his two big runs for a total of 130 yards against Washington). It is a good sign that the Giants’ coaching staff was able to scheme around the lack of a run game and keep the offense moving and on schedule. Barkley played 57 of the Giants’ 65 offensive snaps, picking up a total of 77 yards from scrimmage. He carried the ball 21 times for 43 yards and a touchdown, and added another 5 receptions on 7 targets for 34 yards. The offensive stars of the game were Sterling Shepard and Evan Engram. 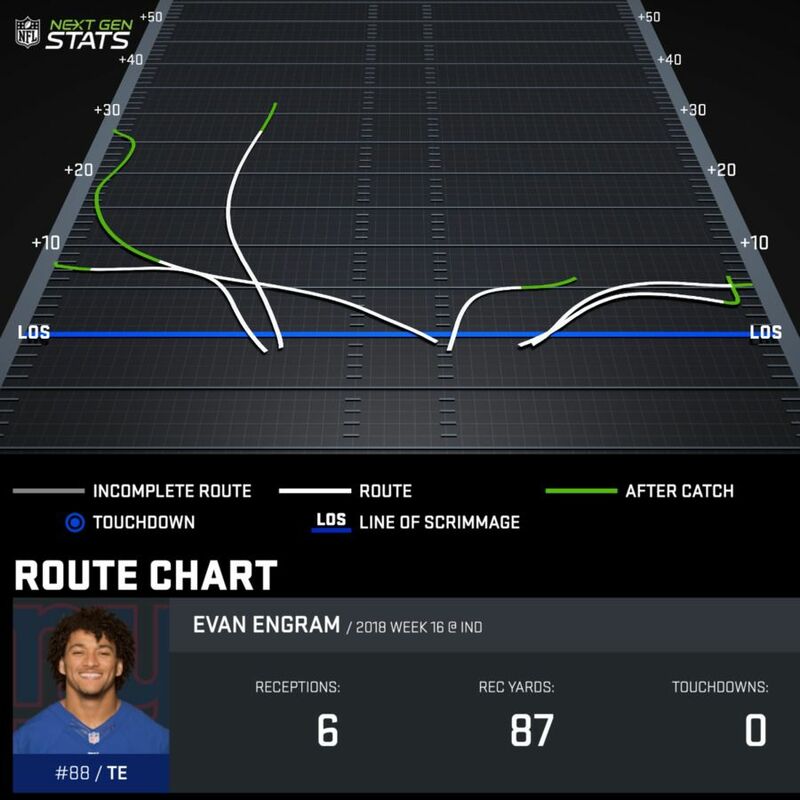 Engram continues to be a weapon for the Giants in the absence of Odell Beckham. The Giants made great use of his talents and he lead the team with a total of 113 yards from scrimmage with 26 rushing and 86 receiving yards on 42 snaps (65 percent). 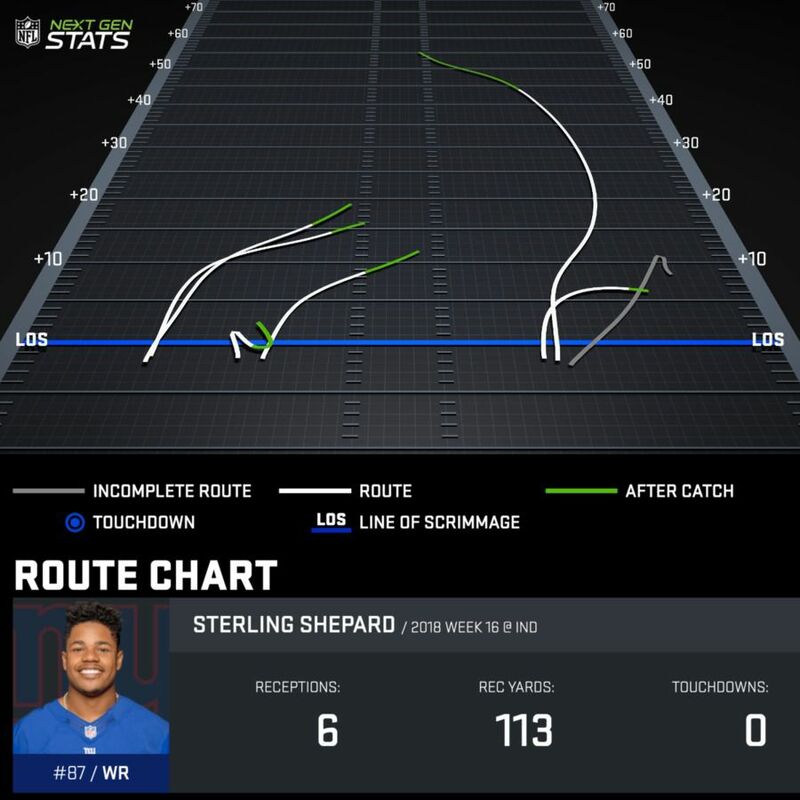 Sterling Shepard had a fantastic bounce-back game after having his worst outing as a pro against the Titans. Shepard played 58 of 65 snaps (89 percent), and came up with 113 yards receiving on six receptions. He also lost three yards on his lone carry, to drop him behind Engram on the total yardage list. 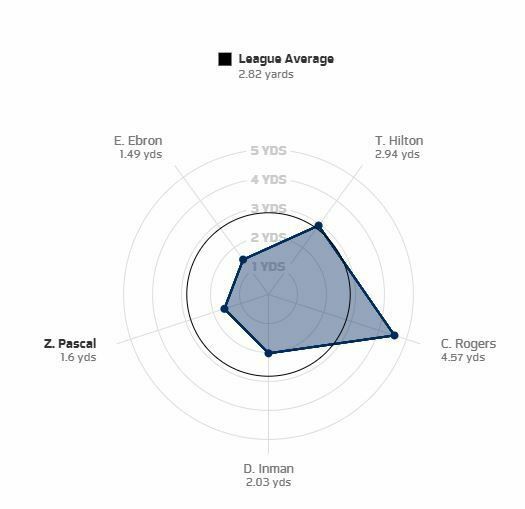 Beyond Engram, Shepard, and Barkley, Manning targeted six other receivers. Filling in for the injured Alec Ogletree, UDFA rookie linebacker Tae Davis played every one of the Giants’ 67 defensive snaps. The Colts were able to isolate and exploit him in coverage, but he still showed up on the stat sheet with 7 total tackles and the lone sack of the game. 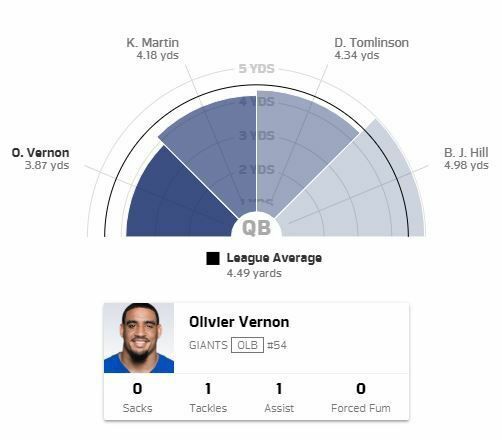 After Davis, it shouldn’t surprise that Olivier Vernon played the second-most snaps among front seven players, with 64 of 67 snaps. Vernon was quietly disruptive as a pass rusher against the Colts’ talented offensive line. He had a strip-sack negated by penalty, but was credited with a pair of QB hits and was the Giants’ most successful rusher per Next Gen Stats. Surprisingly, DT B.J. Hill has emerged as one of the Giants’ core defensive players, and played just one less snap than Vernon at 63 on the game. That high snap count might have been influenced by the early loss of Mario Edwards Jr. to a calf injury, and Hill only came up with a single quarterback hit and no tackles. B.J. Goodson was second among linebackers with 55 snaps. And as usual, he was productive going downhill, with six total tackles and a tackle for a loss. On the defensive line, EDGE Kareem Martin and DT Dalvin Tomlinson were tied with 45 snaps. Martin was quiet, notching a single tackle, while Tomlinson finished with four tackles and a tackle for a loss. EDGE Lorenzo Carter saw 29 snaps, coming up with a pair of QB hits and a pass defensed (which probably should have been intercepted). Josh Mauro rounds out the major contributors with 25 snaps. Cornerbacks Janoris Jenkins and B.W. Webb, as well as safeties Michael Thomas and Curtis Riley played every one of the Giants’ 67 snaps. And while the Giants’ struggled to stop, or even slow, the Colts’ offense once it got going, their coverage was actually quite tight. Riley came up with an interception in the first half, sprinting to the endzone to catch an errant throw from Andrew Luck like a wide receiver running a corner route. Jenkins and Webb each had their hands on passes of their own, but both times the ball found the turf. Thomas has continued to thrive in his expanded role, racking up seven tackles and a pass defensed. Grant Haley is a starter in all but name, playing 57 of 67 snaps (85 percent), and picked up seven tackles on the day. Haley has his rookie moments in games, but he has done well to grow into his role as the nickel corner and looks to be a good piece for the future. Likewise, Sean Chandler might be the Giants’ most efficient defender. He had a tackle, a tackle for a loss, and a pass defensed in just 8 defensive snaps. The Giants’ other UDFA rookie defensive back doesn’t see much time on the field, but James Bettcher clearly has a plan for when to use him, and he produces when he gets on the field.